We make a set of four Small Spring Flowers. The flowers are built in our workshop. The flower's petals are hand painted pink, purple, orange, and blue. The center is a yellow circle. The small flower is 4.25 inches tall by 4.25 inches wide by 1.5 inches deep. The peg is 20 inches tall. The weight with packaging is 2 pounds. For the continental U.S. shipping and handling is included in the listed price. For shipping outside the continental U.S. please contact us through our Contact Us page. We make a set of four Large Spring Flowers. The flowers are built in our workshop. The flowers petals are hand painted pink, purple, orange, and blue. The center of the flower is a yellow star. The dimensions are 5 inches tall by 5 inches wide by 1.5 inches deep. The peg is 20 inches tall. The weight with packaging is 2 pounds. For the continental U.S. shipping and handling is included in the listed price. For shipping outside the continental U.S. please contact us through our Contact Us page. We make Yellow Flowers. The item is built in our workshop. 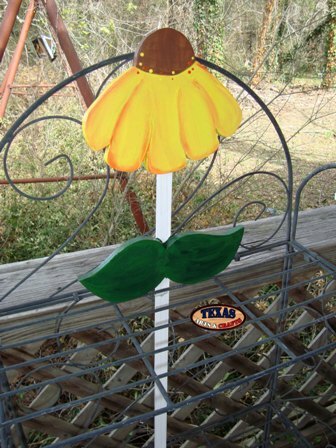 The flower is hand painted yellow with a brown center and green leaves. The dimensions are 6.75 inches tall by 8 inches wide by 1 inch deep. The stake is 28 inches tall. The weight with packaging is 1.75 pounds. For the continental U.S. shipping and handling is included in the listed price. For shipping outside the continental U.S. please contact us through our Contact Us page. We make Red Flowers. The item is built in our workshop. 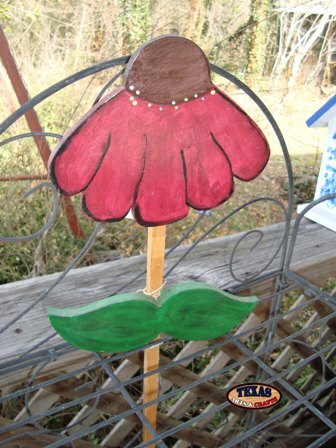 The flower is hand painted red with a brown center and green leaves. 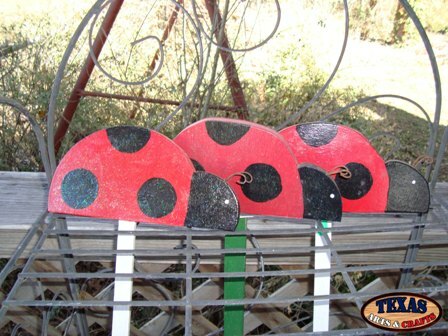 We make a set of Three Lady Bugs. 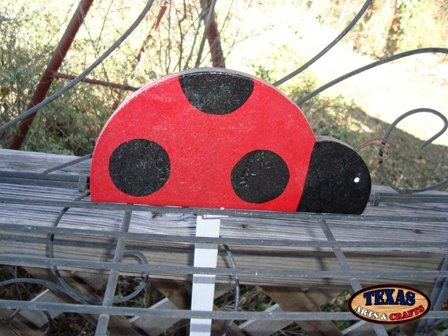 The lady bugs are built in our workshop. The lady bugs are hand painted red with black dots. The individual dimensions are 4.25 inches tall by 9 inches wide by 1 inch deep. The peg is 10 inches tall. The combined depth is 5 inches with packaging The weight for the three signs with packaging is 2.50 pounds. For the continental U.S. shipping and handling is included in the listed price. For shipping outside the continental U.S. please contact us through our Contact Us page. 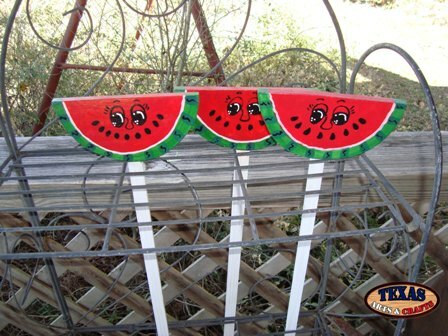 We make a set of Three Watermelons. The signs are built in our workshop. 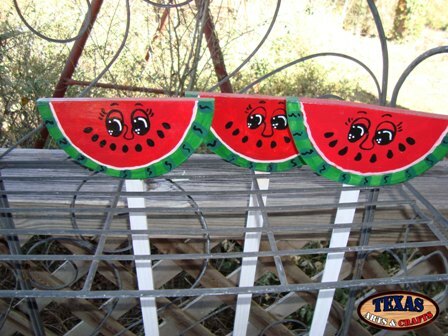 The watermelons are hand painted red and green. The individual dimensions are 3.50 inches tall by 7 inches wide by 1 inch deep. The peg is 30 inches tall. The combined depth is 5 inches with packaging. The combined weight with packaging is 2 pounds. For the continental U.S. shipping and handling is included in the listed price. For shipping outside the continental U.S. please contact us through our Contact Us page. 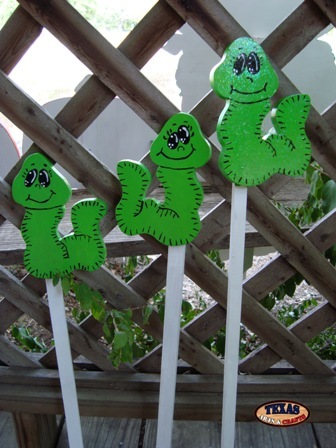 We make a set of Four Green Worms. The signs are built in our workshop. 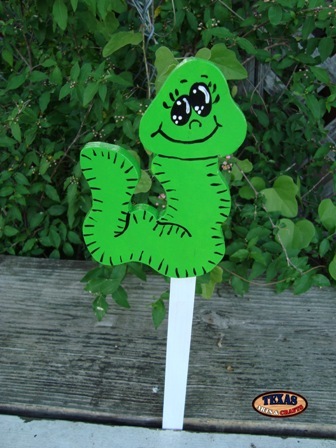 The worms are hand painted green. The individual dimensions are 6 inches tall by 4.50 inches wide by 1 inch deep. The peg is 20 inches tall. The combined depth is 5 inches with packaging. The combined weight with packaging is 2 pounds. For the continental U.S. shipping and handling is included in the listed price. For shipping outside the continental U.S. please contact us through our Contact Us page. We make a set of Three Small Worms. The signs are built in our workshop. The worms are hand painted green. The individual dimensions are 6 inches tall by 4.50 inches wide by 1 inch deep. The peg is 20 inches tall. The combined depth is 4 inches with packaging. The combined weight with packaging is 1.75 pounds. For the continental U.S. shipping and handling is included in the listed price. For shipping outside the continental U.S. please contact us through our Contact Us page. We make a set of Three Tiny Lady Bugs. The signs are built in our workshop. 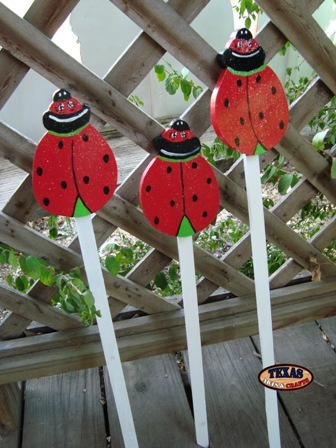 The lady bugs are hand painted red and black with black dots. The individual dimensions are 6 inches tall by 4 inches wide by 1 inch deep. The peg is 24 inches tall. The combined depth is 4 inches with packaging. The combined weight with packaging is 1.50 pounds. For the continental U.S. shipping and handling is included in the listed price. For shipping outside the continental U.S. please contact us through our Contact Us page.